Freeze or microwave. Aqua beads help hold the heat or cold. 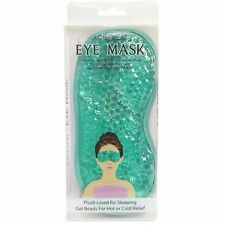 Cooling Gel Eye Mask. Baking & Preserving. Aqua Beads. Soothes face muscles while you sleep. Aids in sleep therapy. Christmas Tinsel. Contains vitamin A, avocado oil and fatty acids. Can be used by all skin types. Protects skin from external aggressors. Pure Emu oil is similar in composition and texture to natural human oils. 25g with EMU OIL. We have made this cream as natural as possible. It contains no artifical colours Ingredients: Aqua, Emu Oil, Glycerin, Cocos nucifera, Butyrospermum Parkii, Cetearyl Alcohol, Aloe barbadensis, Cetyl Alcohol, Hyaluronic Acid, Retinyl Palmitate, Betaine, Phenoxyethanol, Fragrance. 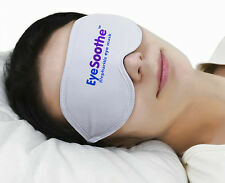 This Eye patch is ideal for relieving and relaxing dry tired eyes, soothing headaches and puffy eyes. Can be used for soothing waxed eyebrows and reduces swelling. Cold mask relieves dry, puffy eyes and headaches. Suivez l’application du contour des yeux en 3 étapes • ILLUMINE : un mélange anti-irritant concentré de trois extraits d'algues puissant qui agit pour apaiser la peau délicate du contour de l'œil. Soothing Eye Mask. relieves stress and tired. To Warm the mask place in a bowl of warm water (no hotter than 60 degrees). To Cool mask place in the refrigerator. Material: Liquid gel. 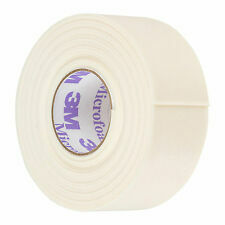 Secured around the head with elasticated band. Aqua, Glycerin, Caprylyl Glycol, Cucumber Fruit Extract, Phenoxyethanol, Sucrose Laurate, Sorbitol, Ethylhexylethanol, Lecithin, Caffeine, Escin, Xanthan Gum, Tocopherol (Vitamin E), Glaucium Flavum (Leaf) Extract, Sucrose Dilaurate, Euglena Gracilis Extract, Sucrose Trilaurate, Potassium Sorbate, Sodium Benzoate, Citric Acid. ALLOW 30 MINUTES BETWEEN EACH APPLICATION. 10ml BOTTLE. We Ship Worldwide! Lowest Price Anywhere! The effects of Eyesential have to be seen to be believed. 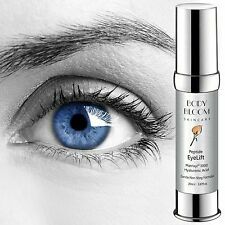 Eyesential is a unique non-surgical under eye enhancer. It works to visibly reduce puffiness, fine lines and dark circles, non-surgically in minutes. Estee Lauder Advanced Night Repair Synchronized Recovery Eye Concentrate Matrix Cream 15ml. Magnify the beauty of your eyes. Fortifies: With 360° Matrix Technology, it strengthens the delicate skin around your eyes. OPTASE Moist Heat Mask features HydroBead Technology, which absorbs moisture from the air and releases a natural, constant moist heat for the relief of Dry Eye and other related eye problems such as blepharitis. It is really simple to use: just 25 seconds in the microwave will provide 10 minutes of the prescribed Moist Heat Therapy. DR. MORITA. Firming and Brightening Eye Patch Mask for Dark Circles. Wash the face. Apply the mask under the eye for 5-10 minutes (Depending on the skin condition. Do not apply more than 10 minutes). Active, cooling cream-gel masque energises skin to reduce visible signs of stress. Apply Stress Eye Lift generously around cleansed eye area using cooling massage applicator. X 8 samples. Features Hyaluronic Acid, Licorice Extract and a Vitamin Complex. 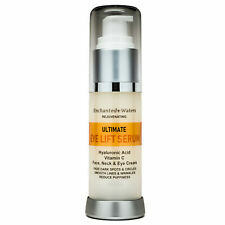 - Specifically designed to brighten and smooth the under eye area for a well-rested look. 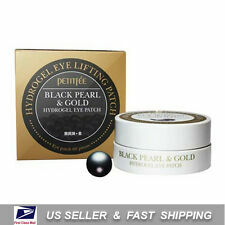 - Apply pearl sized amount around eye area and smooth in until absorbed. GARNIER CAFFEINE ROLL-ON OCCHI ANTI BORSE E OCCHIAIE ATTENUA L'ASPETTO DEGLI OCCHI STANCHI. LE OCCHIAIE SONO ATTENUATE. It takes a special cleanser to remove WUNDERBROW as it had been made to stay on until you are ready to take it off! The WUNDERCLEANSE Eyebrow Gel Remover is an oil-based cleanser that removes all traces of product very gently, leaving your skin feeling clean and soft. WHAT IS GLYCOLIC ACID?. Glycolic acid works as an exfoliating agent because of its high acidity but easy solubility. Aloe Vera (Aloe Barbadensis) –Aloe Vera is one of nature’s very best hydrators. We use organic aloe vera as a base for most of our skincare products because 2of its ability to hydrate the skin – and help. CeraVe Eye Repair Cream for Dark Circles and Puffiness visibly reduces the look of dark circles and puffiness. I always reply within 24 hours if not less. - Fragrance free. - Ideal for all skin types. A natural, soothing, 3 in 1 eye cream. Luxuriously formulated to assist with fine lines and wrinkles. Enriched with antioxidant rich Argan Oil for its anti-ageing properties and Vitamin K2 to help minimise dark circles. Active Ingredients: Hyaluronic Acid Microspheres, Vitamin E. Capacity: 50ml. Wrinkle Filler is suitable for mature skin around eyes. Smooths out wrinkles from the inside. Supports the renewal of collagen fibres. OLAY EYES ULTIMATE EYE CREAM FOR DARK CIRCELS,WRINKLES AND PUFFINESS 13ML(0.4oz). Condition is New. Shipped with USPS First Class Package. There was also a reduction inscaling, puffiness, wrinkles and laxity of skin. HIMALAYA HERBALS. Himalaya’sUnder Eye Cream contains a proven and safe blend of herbs specially created to care for the delicate area around the eyes. Along with dipotassium glycyrrhizate extracted from licorice root, coix seed extract that contains lot of minerals and kyonin extract taken from the seed of apricot, this also contains other plant-derived ingredients. Perfect way to try out an expensive beauty item at a fraction of the price! Pink heart shaped patch contains rose extract. It will help hydrate eyes and cheeks. After 15 - 20 minutes, remove the sheet and dab the remaining essence on the face for absorption. After washing your face, place sheets on cheeks and nasolabial folds (smile lines). CREMA ANTIRUGHE PER IL CONTORNO OCCHI ml 50. Assistenza tecnica e consulenza tecnica sui prodotti: permanente e valida anche per chi non ha acquistato. For Eyes. Sagging skin and bags under your eyes? When you're run down and stressed out, the delicate skin under your eyes really takes a beating, resulting in puffiness and premature wrinkling. In just ten minutes, Skyn Iceland Hydro Cool Firming Eye Gels, a cooling transdermal gel patch, infuses the eye area with Icelandic glacial waters and concentrated doses of firming ingredients to de-puff, tone and reduce the appearance of fine lines and wrinkles. I do try my best to describe as accurate as possible. I do not condone cheap copies or anyone who tries perpetrate fraud. Reduce eye puffiness and take all that stress away with the Star Gazing Eye Masks. W7 STAR GAZING EYE SOOTHING GEL MASK. The Star Gazing eye masks contain a gel filling that can be heated or cooled to your preference for relief around the eye area. BORGHESE Intensive Eye Serum 15ml/0.5oz each unbox. Nivea For Men EYE ROLLER GEL Energy Q10 Dark Circle Puffy 0.33oz Tube FREE SHIP!